Azerbaijan’s Defense Minister, Colonel General Zakir Hasanov met with the newly appointed head of the European Union (EU) Delegation to Azerbaijan, Ambassador Kestutis Jankauskas on October 23. Hasanov congratulated the Ambassador with the beginning of his activity in Azerbaijan and wished him success in developing relations between the country and the EU. During the meeting, the parties discussed issues related to the current situation in the settlement of the Nagorno-Karabakh conflict. 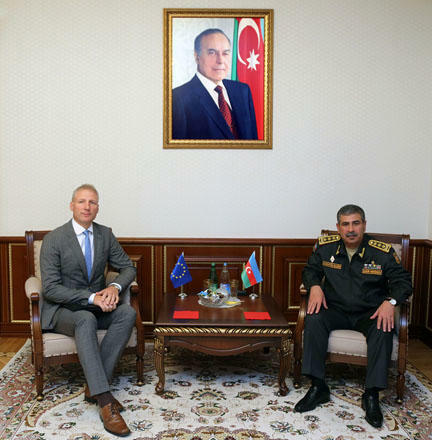 The defense minister informed Jankauskas about the continuing occupation of the Azerbaijani territories, recognized by the international community, for more than 20 years, as a result of which more than one million people became internally displaced persons. Hasanov also noted that Armenia continues to aggravate the situation up to this day. The minister stressed that due to threats to the lives of civilians and military personnel caused by provocations by the Armenian armed forces, the best way to resolve the conflict is the unconditional withdrawal of the occupation troops from the territory of Azerbaijan in line with the norms and principles of international law. Ambassador Jankauskas, in turn, emphasized that the European Union supports the early and peaceful resolution of the conflict, and the continuation of negotiations in this sphere in order to ensure stability in the region. The sides also exchanged views on the military-political situation in the region and other issues of mutual interest. Azerbaijan has long ago stated it is ready to settle the conflict through direct negotiations with Armenia with mediation of the OSCE Minsk Group co-chairs. However, the Armenian side is constantly trying to make up reasons to avoid a constructive dialogue and preserve the unacceptable status quo in Nagorno-Karabakh.